KD165D KNOCK DOWN™ Ant Attack Killer Dust – KUUS Inc. Kills Ants within 2 days. Insects have a thin covering of wax that helps to prevent water loss from their bodies. Diatomaceous Earth (DE) kills insects through internal and external cutting action, which also causes the dehydration of insect pests. Insects crawl over the applied dust, the dust adheres to their body covering and within 2 days the insect will be killed. If attractants (baits) are added then the insect pests will also eat the powder, it will damage their gut and the insect will be killed. Knock Down Dust Diatomaceous Earth is a natural solution* where insects will not develop a resistance to the active. Knock Down Dust Diatomaceous Earth is a great part of any good IPM (Integrated Pest Management) program. For control of: ANTS and other insects such as, earwigs, cockroaches, beetles, spiders, fleas, silverfish, bedbugs, crickets, grain insects. 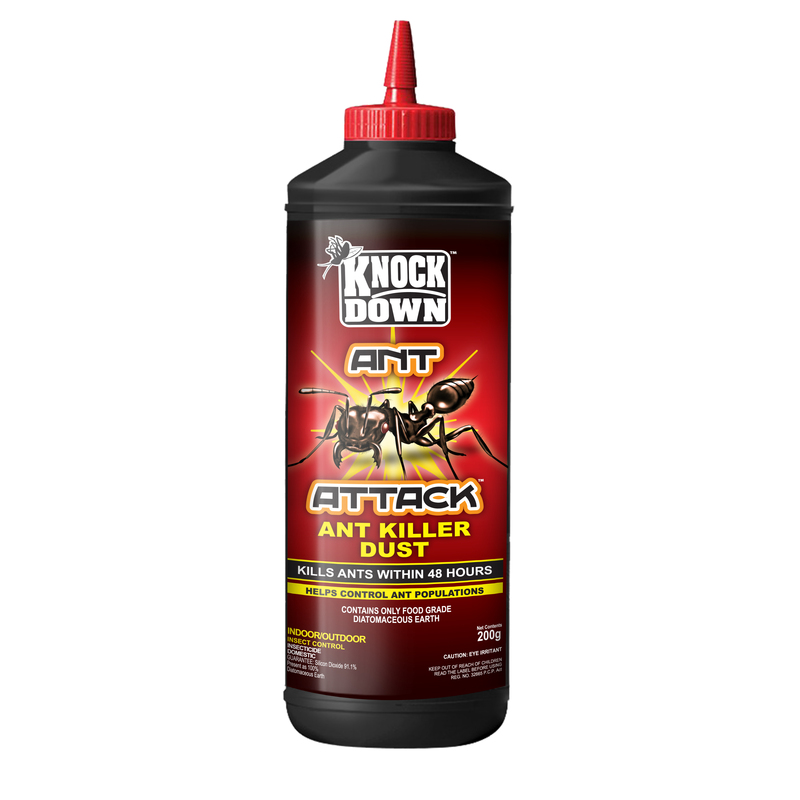 Knock Down™ANT ATTACK” Diatomaceous Earth Ant Killer Dust helps gardeners take advantage of mineral deposits of diatoms to control ants and other crawling insects in the garden. ANT ATTACK is Food Grade, odourless, non-staining, and usually works within 48 hours. For use with or without attractants, indoor and outdoor. Apply to cracks and crevices, under and behind appliances cupboards, and other places where insects are found. Use squeeze bottle to apply into cracks and crevices. When treating surfaces, apply as a thin film at the rate of 500 grams per 100 sq. meters. When the powder is mixed and applied with attractants, the mixture attracts certain insects to stay longer on the treated surfaces and to eat the powder. The DE particles damage the insect’s gut and the insects lose water through damaged tissue (internal desiccation). Apply the mixture into cracks and crevices, or in discrete small piles under and behind appliances, furniture, cupboards and also cover surfaces using a thin film. Check baits periodically and vacuum or remove if moldy or otherwise spoiled. (Mix from 25% to 50% in volume) Icing sugar, and/or cereal powder, and/or peanut or other nut powders, and/or powdered dried fruits, and/or powdered yeast, and/or powdered soup mixes, and/or dried egg powder, and/or any other dried powder substance that attracts the insect. NOTE: Wherever applied, the powder controls until it is washed away.